>WE SURVIVED! Huzzah! Today was Holden’s two month check up with his pediatrician which means we started his immunization schedule. To say I wasn’t looking forward to the shots would be an understatement. I was SO nervous for him! It’s terrible to see your child in pain and shots=pain. I found myself wishing all week that Allan would somehow miraculously be able to take off of work and go for me but alas, Friday came and no such miracle occurred. We got there and they took his “stats.” He is 24.5 inches tall (a 2 inch increase from last month) which puts him in the 92nd percentile! He’s definitely taking after Allan in the height department. He weighed in at 12 lbs .5 oz (I was right on the dot practically!) which puts him in the 54th percentile. 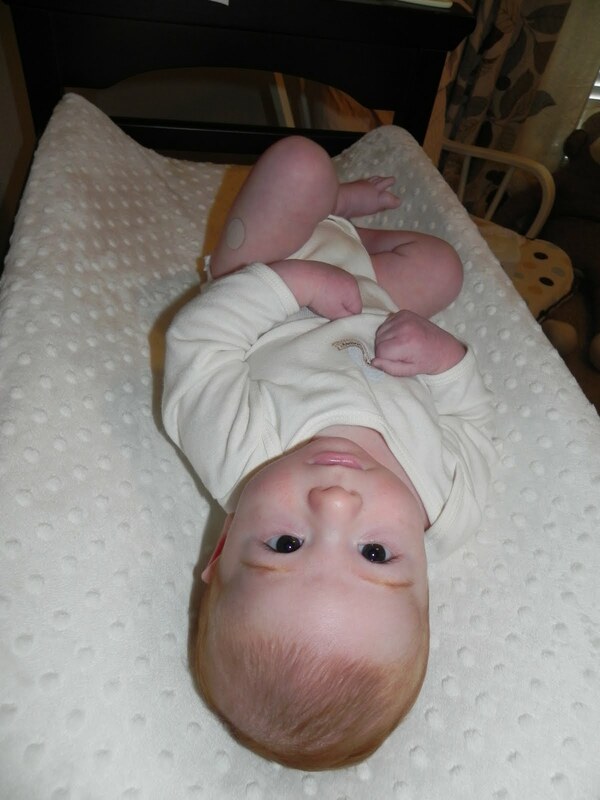 Last but not least, his head measured in at 15 inches which puts him in the 11th percentile. My baby’s got a small head 🙂 Then we met with the nurse practitioner, Christie Duffy. She is GREAT. She makes up for some other people in the office I’m not too fond of :). She loves children, you can tell. She is so sweet with Holden. She cuddles him and is really patient. I told her about my concerns with his skin. I mentioned before that he has sensitive skin. WOW, does he have sensitive skin. I have to do so many things daily just to keep irritations at bay. She looked under his neck and told us to pick up some Lotrimin and apply twice daily for a week. For his ears, olive oil will apparently do the trick! Who woulda thunk! She also recommended shea butter or coconut butter for his dry skin (everywhere but his neck), calendula cream for his cradle cap (which has gotten soooo much better. I was already doing this one – yay! I did something right! ), flax seed oil & probiotics for me. She also recommended I try cutting a few things out one at a time to see if that helps his skin. Sheesh – I already gave up milk and chocolate!! Now I have to try eggs and wheat! What am I going to be able to eat?! It’s all worth it though if it helps him. He’s down for another nap so I’m going to go reward myself with a bath while I read Frankenstein for our book club! ****UPDATE***** Holden is sure feeling the after affects of the shots. He has been crying for hours. It’s so hard 🙁 🙁 🙁 Hurry up, Dad, with the baby tylenol!! >I'm so glad your appointment went well but sorry that he's not feeling good now. Poor little guy! It sounds like he's right on track for weight and is going to be a tall boy! I've been on a restricted diet for a while now with Elyse. She has sensitive digestion so to speak. It's SO hard. I started by cutting out chocolate and all dairy. Now I can't have anything with soy either. It takes me forever to get through the grocery store because I have to read the ingredients of everything we buy to make sure it's dairy free, soy free. Whenever we meet up for lunch we'll have to go someplace with salads! Haha! Hope your night gets better! >Oh and this pictures is soooooo precious!!!!! I see his little boo boos!